The Siddeleys' star shone briefly and brightly for two years at the end of the 1980s. Their songs were epic, but never pompous, instant, but never obvious - the essential essence of all great pop music. Singer Johnny Johnson was frequently labeled a female Morrissey - a journalistic absurdity favoured by certain writers at the time, but ten years on the songs speak for themselves and comparisons with anyone are hard to make. At the beginning of 1988 the NME predicted that The Siddeleys would join the big league and become one of the major events of the future. Sadly, despite the fierce adoration of a legion of fans and affirmations from the press, the story was over at the end of the first chapter. 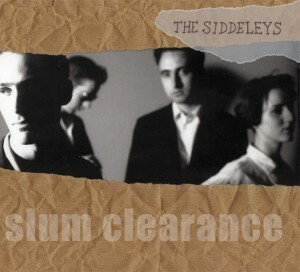 All that remained for Siddeleys fans was the hope of finding a spare copy of one of their two insanely rare singles - sometimes fetching upwards of £50 each - and the memory of two John Peel sessions. Slum Clearance collects sixteen songs from the singles, Peel sessions, and two compilation appearances in one beautiful historical artefact complete with photos and extensive linernotes. The sadness of listening to Slum Clearance comes not from the poignant verses that are actually as uplifting as they are melancholic, but from the knowledge that what could have followed such supreme beginnings will never be known.